The Lonely Soldier--the inspiration for the documentary The Invisible War--vividly tells the stories of five women who fought in Iraq between 2003 and 2006--and of the challenges they faced while fighting a war painfully alone. In The Lonely Soldier, Benedict tells the stories of five women who fought in Iraq between 2003 and 2006. She follows them from their childhoods to their enlistments, then takes them through their training, to war and home again, all the while setting the war’s events in context. We meet Jen, white and from a working-class town in the heartland, who still shakes from her wartime traumas; Abbie, who rebelled against a household of liberal Democrats by enlisting in the National Guard; Mickiela, a Mexican American who grew up with a family entangled in L.A. gangs; Terris, an African American mother from D.C. whose childhood was torn by violence; and Eli PaintedCrow, who joined the military to follow Native American tradition and to escape a life of Faulknerian hardship. Between these stories, Benedict weaves those of the forty other Iraq War veterans she interviewed, illuminating the complex issues of war and misogyny, class, race, homophobia, and post-traumatic stress disorder. Each of these stories is unique, yet collectively they add up to a heartbreaking picture of the sacrifices women soldiers are making for this country. Benedict ends by showing how these women came to face the truth of war and by offering suggestions for how the military can improve conditions for female soldiers-including distributing women more evenly throughout units and rejecting male recruits with records of violence against women. Humanizing, urgent, and powerful, The Lonely Soldier is a clarion call for change. 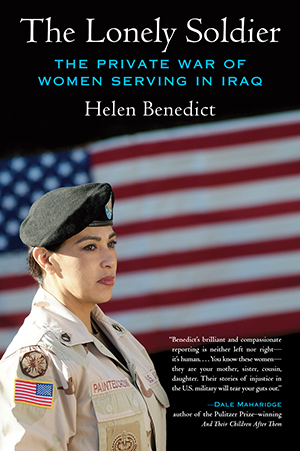 “Whether the soldiers’ language is plainspoken or poetic, Helen Benedict’s book gives them a place to tell their stories. . . . The Lonely Soldier has strong merit as an account of women’s military experience in this long and reckless war.” —Amy Herdy, Ms.
being run, let alone someone who had fought in it. Surely this young soldier was going to be called a traitor by his comrades. So I began to follow the other few veterans who were speaking out like him, curious to see what they were up against, which is how I found army specialist Mickiela Montoya and learned about women at war. I first saw Mickiela in November 2006, standing silently in the back of a Manhattan classroom while a group of male veterans spoke to a small audience. Sentiment had shifted by then, and a poll had just been released showing that the majority of soldiers were now highly critical of why and how the war was being fought. Among women serving in Iraq at the time, 80 percent said they thought the United States should withdraw within a year, and among men, 69.4 percent agreed.1 Wondering how this young woman might feel, I approached her. “Are you a veteran too” I asked. “I’ll listen,” I said. And soon I was listening to all sorts of female soldiers from all over the country who wanted to tell their stories. In the end, I interviewed some forty soldiers and veterans for this book, most of them women. The majority had served in Iraq, but a few had been deployed to Afghanistan or elsewhere. I included a variety of ranks, from privates up to a general; all military branches except the Coast Guard; and soldiers on active duty as well as those in the reserves and the National Guard. I thus use the word soldier to mean members of the Marine Corps and air force as well as the army. Marine Corps major Meredith Brown, who comes from New Orleans, was so proud of her service in Iraq that she said she would go back in a flash if called, even though she’d had a child since her return. “If I got killed out there, my son would understand that I’d died to protect him and other Americans from terrorists coming to our backyard.” But most of the Iraq War veterans I talked to were much more ambivalent. Some praised the military but considered the war disastrous, others found their entire service a nightmare, while yet others fell in between. Read a piece that acknowledges The Lonely Soldier as the inspiration for a Sundance film entrant, "The Invisible War"